The Lunar New Year promises to be an auspicious year, with the Pig representing success in all avenues of life. Sydney’s Queen Victoria Building (QVB) will celebrate the Chinese tradition in style, with an extraordinary wishing tree display and rotating pop-up activations. 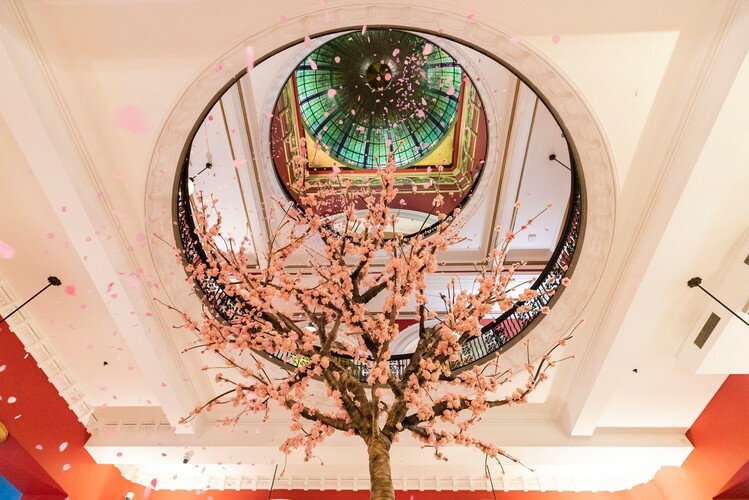 The QVB is launching the QVB Wishing Tree—a peach blossom tree installation beneath the historical central dome. Peach blossoms are a popular motif often depicted in Chinese art. The tree itself was first cultivated in China more than one thousand years ago and is today revered as a symbol of longevity, prosperity and romance. Reaching six metres tall and spanning more than four metres in diameter, visitors can take a seat upon its base to gaze up to take a closer look—the blossoms are actually thousands of tiny felt piglets, in celebration of Year of the Pig. For further information visit Queen Victoria Building website.